In a medium-sized heavy-bottomed ovenproof pot such as a Dutch Oven, heat the olive oil over medium heat. Brown the meat in the oil, in small batches. (Pat the meat dry with paper towel first, otherwise it will not brown well). Once the meat is deeply browned (about 5 minutes on each side), remove it from the pot and put it aside. In the same pot that the meat browned in, add the chopped onion and cook until translucent, about 3 minutes. Add the mushrooms, garlic, and carrots, cooking for about 6 minutes or until they begin to brown. If you need to, add a little glug of oil. Add the flour, salt, and pepper and stir it in well. In a little bowl, stir some of the stock into the tomato paste, to dissolve it a bit. Pour the liquified tomato paste along with the rest of the stock into the pot. Add the remaining ingredients: beer, thyme sprigs, sugar, salt, and pepper. Add the meat and juices back into the pot as well. Bring the whole thing to a simmer, and then place the lid on the pot and put it in a 325F oven for 2 1/2 hours or until the meat is tender and the sauce thickened. Taste the stew and season with a little more salt and pepper if needed. Shortly before the stew comes out of the oven, prepare the mashed potatoes. Peel, rinse, and chop the potatoes into quarters. Cover by 2 inches in a large pot of water and cook over medium-high heat for about 20 to 30 minutes, until they're very tender and easily pierced with a fork. Drain the potatoes and return them to the pot, placing it over low heat. Add the milk and butter and using a potato masher, mash the potatoes until they're creamy. If needed, add a little more milk or cream to get the consistency you like. Add salt and pepper to taste. 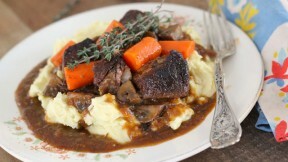 Let the stew cool and settle for a few minutes, then ladle generously on top of a plate mashed potatoes.